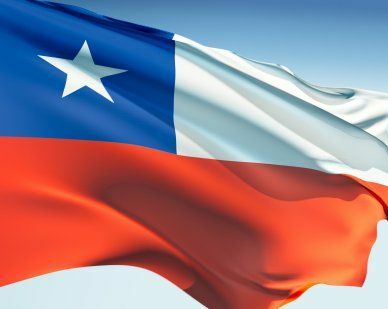 The first Chile flag was used in 1812. It had three horizontal yellow, white and blue stripes, which stood for strength, law, and majesty. This version was abolished in 1814 and the Spanish flag was used in its place. In 1817 a new flag emerged featuring three horizontal stripes of blue, white and red. It only lasted 5 months. Another flag was designed in the same year. It evolved into the flag we know today. It featured two horizontal stripes of red and white with a blue square in the top left corner. A large, white star appears in the flag’s center. Our top-quality Chile flags conform to all official specifications. Emblems and designs are executed with the highest possible degree of accuracy in regard to detail, color shades, placement and proportion to flag size.